OPIE'S POOL Hall arrived more by accident than design, according to the Kirksville, Mo., establishment's owner, Randy Forquer. A 14-year Kirksville city employee, Forquer, a billiards enthusiast who long aspired to own a poolhall, happened upon news that the local poolroom would be shutting its doors. With that opportunity knocking, Forquer purchased the fledgling, old-school hall and pushed its revenue into the black. For Forquer, however, some positive earnings reports failed to quench his billiards thirst. He wanted more, namely an all-ages, family-friendly place that the small-town community could embrace. "I have a young son and if he can't be in here with me, then I'll lock the doors," Forquer said. "From the beginning, I wanted a place where people felt like they belonged." 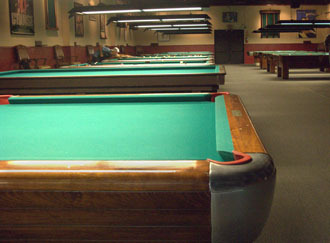 In August 2008, Forquer began an extensive, 21-month project, fashioning a new Opie's Pool Hall out of a one-time antique mall. Outfitted with wooden chairs and wood-paneled walls, Opie's d�cor reminds of a quaint lodge in the northern woods. For Forquer and his patrons, the look is both timeless and classic, a perfect small-town poolhall with its elevated seating for viewing and safe, friendly atmosphere. 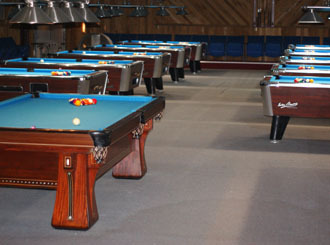 Kirksville native Bill Young, the owner of Chalk Box, Inc. and Quincy Billiards, supplied Forquer with much of Opie's d�cor, including a trio of restored tables: a 10-foot Brunswick Arcade billiards table, a 10-foot Brunswick Anniversary snooker table, and a 9-foot Brunswick Arcade pool table. Fourteen Valley coin-op tables, all covered in Simonis 860 Tournament Blue cloth, line Opie's playing floor. "A love of the sport and its history drove the design," Young says. "Kirksville's always had a good billiards room and Opie's is its latest incarnation." Young also provided custom-made oak inlaid cue racks and antique memorabilia that line Opie's walls, including Young's personal collection of Billiards Digest, some dating back over 30 years. "The antique elements give people something to remember when they walk out and certainly showcase the respect we have for the game," Young says. Forquer also rents the adjacent space and has created Opie's Steakhouse, a second family-friendly destination local residents have quickly adopted as a welcome addition to the northeast Missouri scene. In addition to a hearty menu, the steakhouse features a 24-foot, art deco back bar with neon lighting, another nod to days past. "I confess I don't know much about the restaurant business, so I entrust that to the people who know what they're doing," Forquer says. "I'm fortunate many folks want to see me succeed and Opie's do well." For Young, Opie's and Kirksville complement one another, each embracing and representing the other's worthy qualities - friendly, comfortable and familiar. "Opie's is a special place in a special town," he said. THEIR MEETING was something of an accident. In 2007, Jeff Edman, a publishing executive, was getting set to retire. His employees, knowing him as an avid pool enthusiast, decided to buy him a cue as a retirement present. At the supply store, the employees met Tony Annigoni, who at the time was on something of a sabbatical from opening poolrooms in San Francisco area. Annigoni, best known as the subject of David McCumber's 1996 book, "Playing Off The Rail," sold Edman's employees a Predator Cue and threw in a couple of free pool lessons. When Edman came to collect, he and Annigoni got talking about pool and Annigoni's desire to open yet another poolroom. Before you could say "9-ball, corner pocket," they were scouting around the area for possible locations. In the town of Fairfield, Calif., they discovered a motorcycle shop that had gone out of business. The two went to work restoring the 4,500-square-foot space. "We spent two years looking for a friendly landlord in a friendly city, and found them both here in Fairfield," said Edman. "We felt it was the best location because the city really wanted us, and the competition was low." From the very beginning, the idea was to create a space that was dedicated to the sport of billiards, in all of its permutations, which included snooker and three-cushion billiards (the room boasts tables for both). There's no bar, no video games, no wide-screen TVs. No live music on the weekends. Annigoni's private collection of antique memorabilia - everything from tournament sheets to a movie poster for "The Color of Money" in French - informed the d�cor. "We're trying to recreate the atmosphere and the commercial feel ... [from] when pool was in its heyday," said Annigoni. "Our goal for the Two Cushion Club has been to create a serious room for serious players, with instruction for those who want to learn," Edman said. The two hope to expand the concept and open other Two Cushion Clubs, though plans for doing so are on hold, as Annigoni and the Club solidified plans for the Pacific Rim International Billiard Expo, set for the end of this month at the Peppermill Resort Spa Casino in Reno, Nev.